Sarah Calhoun started her higher education journey at Colorado Mountain College in Glenwood Springs, Colorado. After a year in Glenwood, she transferred to Colorado College. She ultimately graduated with a B.A. of Anthropology from the University of Colorado at Colorado Springs. In 2012 she decided to pursue a teaching licensure. 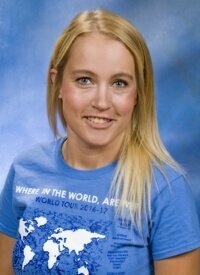 Sarah was accepted into the Teaching and Learning Program at the University of Colorado at Colorado Springs. She completed her student teaching at a public Montessori School in a primary level classroom. Upon completing the Teaching and Learning Program, Sarah obtained her Colorado Teaching Licensure and spent another year in the Montessori classroom. She spent her second year teaching at a local elementary classroom as a kindergarten teacher, and then came to Academy for Advanced and Creative Learning. In her free time, Sarah enjoys spending time with her daughter, snowboarding, fossil hunting, finding cool rocks while hiking, going to the dog park and window shopping. Sarah is a Colorado Native and was born and raised right here in Colorado Springs.